Today, HRC President Chad Griffin and staff joined Freedom Oklahoma at the Oklahoma State Capitol to oppose SB 1140, a proposed license to discriminate in the provision of child welfare services. The House Judiciary Committee voted to advance SB 1140 with an amendment to the full House of Representatives for consideration--one step closer to the governor's desk and becoming law. Throughout this session, HRC has stood alongside Freedom Oklahoma in the fight to stop SB 1140 and anti-LGBTQ legislation, engaging members and supporters through emails, texts, call programs and actions on the ground. “While the House Judiciary Committee’s amendment would limit the permissible discriminatory behavior to agencies that do not receive public funding, LGBTQ Oklahomans will continue to be subjected to discrimination under this dangerous law,” added Oakley. “Further, the limiting amendment could be stripped away--increasing the impact of the bill--as it moves through the legislature. Last month, Oakley joined Freedom Oklahoma for its annual LGBTQ Lobby Day at the Capitol to advocate against Oklahoma’s slate of anti-LGBTQ legislation and SB 1140, which advanced out of the Senate by a 35-9 vote. As thousands of educators gather to protest education budget cuts at the Capitol, anti-equality lawmakers are instead focused on advancing legislation that would harm Oklahoma’s most vulnerable children from finding forever homes. HRC recently launched a powerful video highlighting the story of Lupe, who aged out of foster care, and her two adoptive fathers, Clay and Bryan. Lupe’s story and the story of children currently in Oklahoma’s adoption and foster care system illustrates the importance of this fight. Children who deserve a forever home should not be forced to age out or wait when a qualified family is waiting to adopt or foster the child. 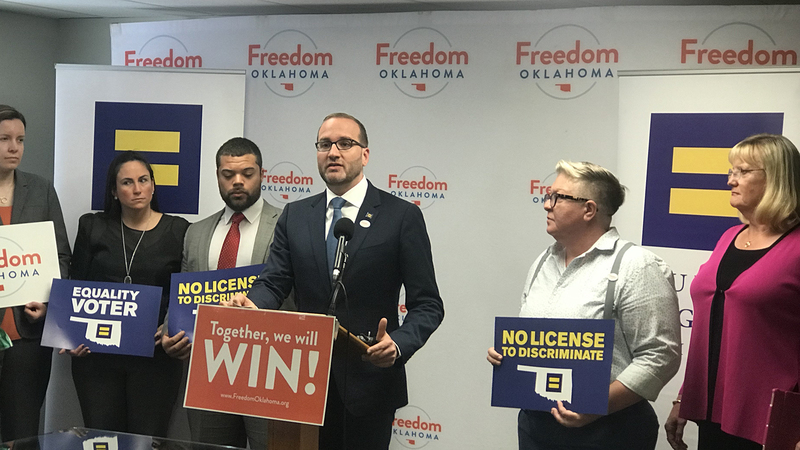 HRC will continue working with our partners at Freedom Oklahoma to oppose SB 1140 and any other discriminatory legislation that targets LGBTQ Oklahomans.